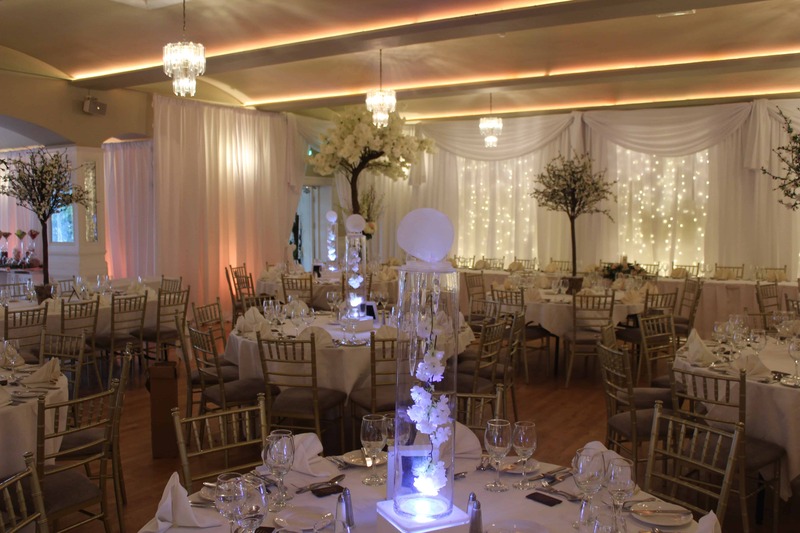 Wow-Weddings have the widest range of wedding products in Ireland. 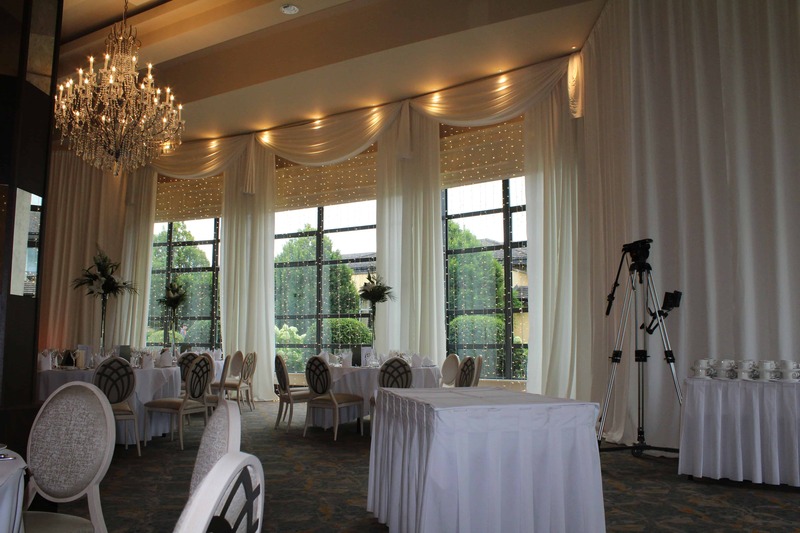 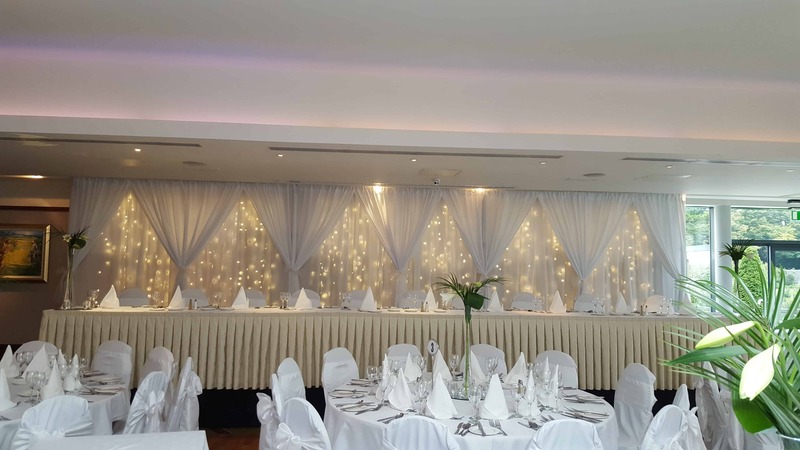 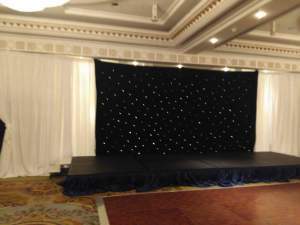 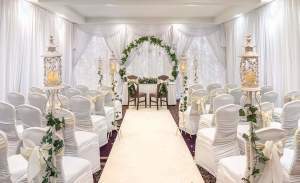 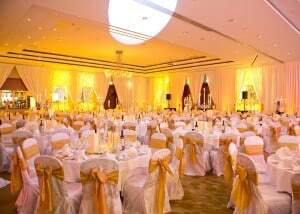 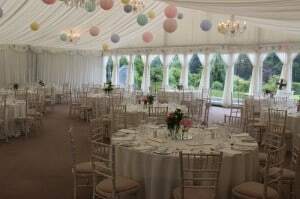 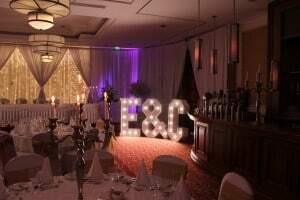 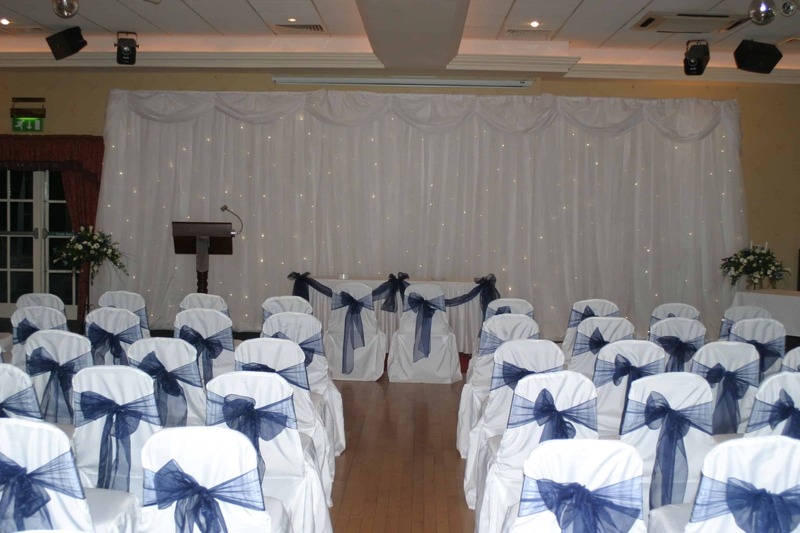 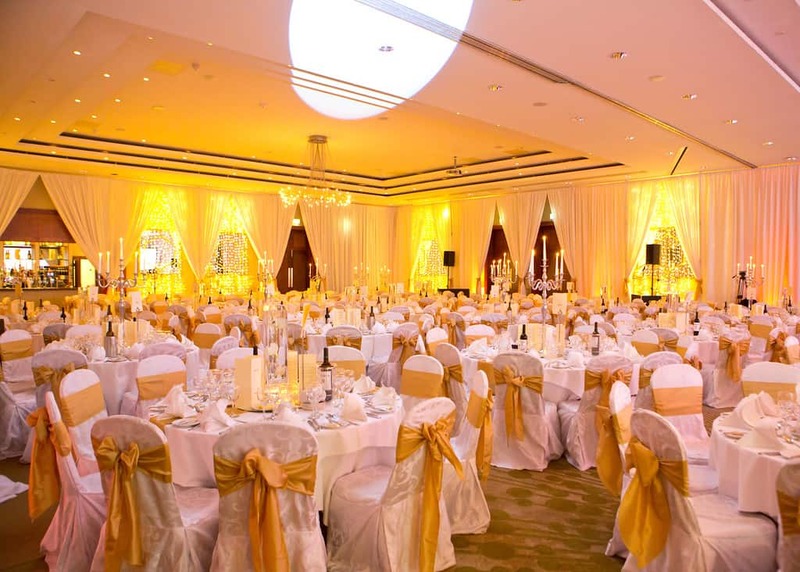 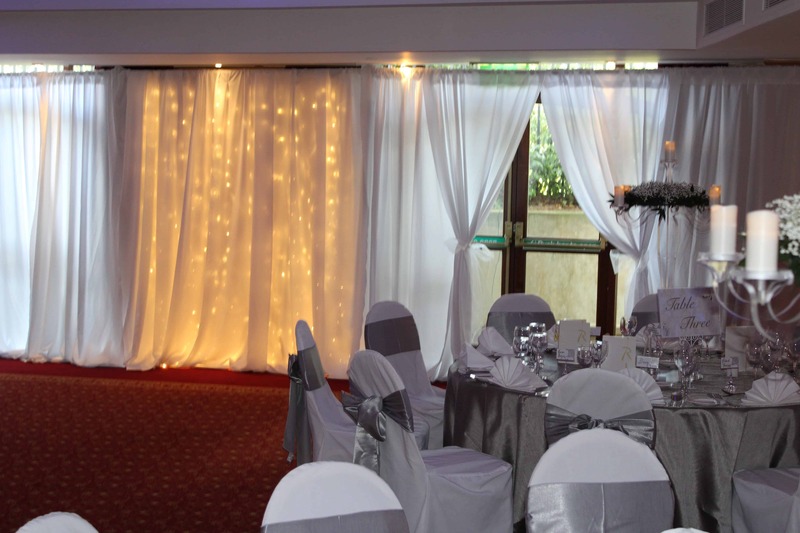 We can provide literally anything from your sashes to a full room floor to ceiling custom draping and anything in between. 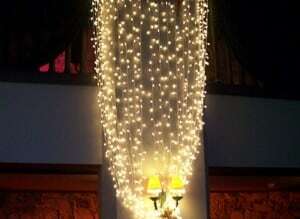 Fairy Lights. Virtually every wedding will have fairy lights in some shape or form and within our wedding products we have an amazing range of options. Fairy Light Backdrop Standard: Up to 30 ft wide by up to 12 ft high. 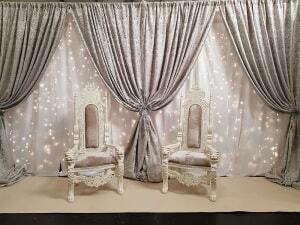 Fairylight Backdrop Custom Built Curtain Style. 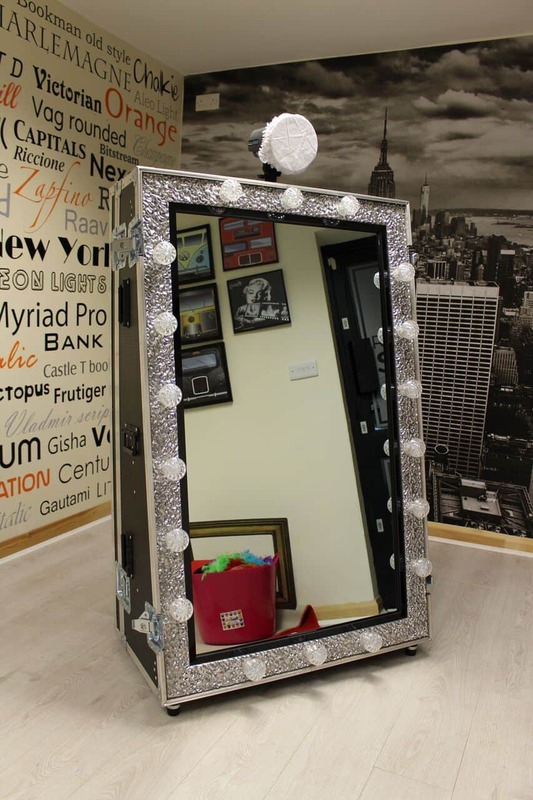 Can be built to any size. 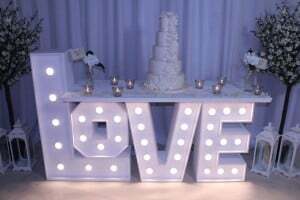 Custom Fairy Light Backdrop With Swag Can be built to any size. 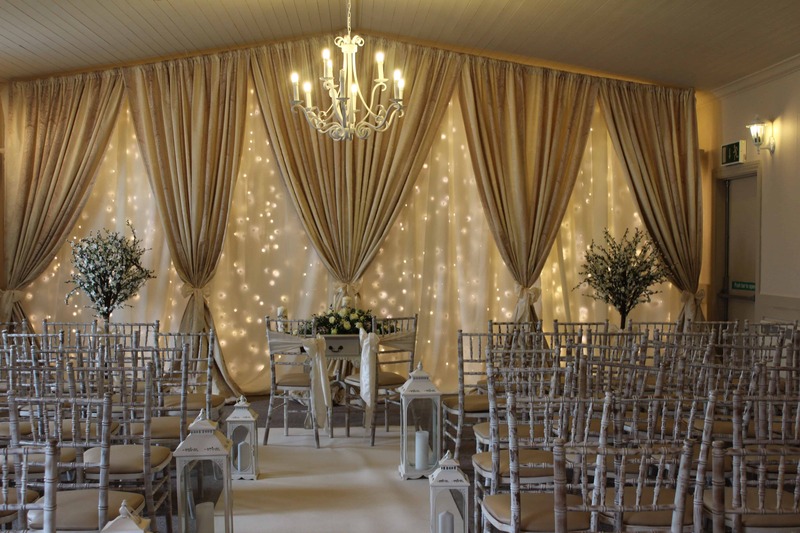 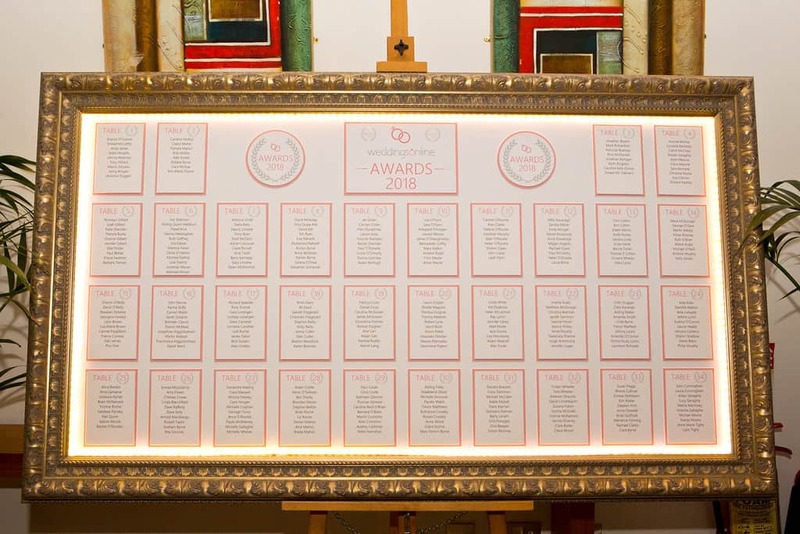 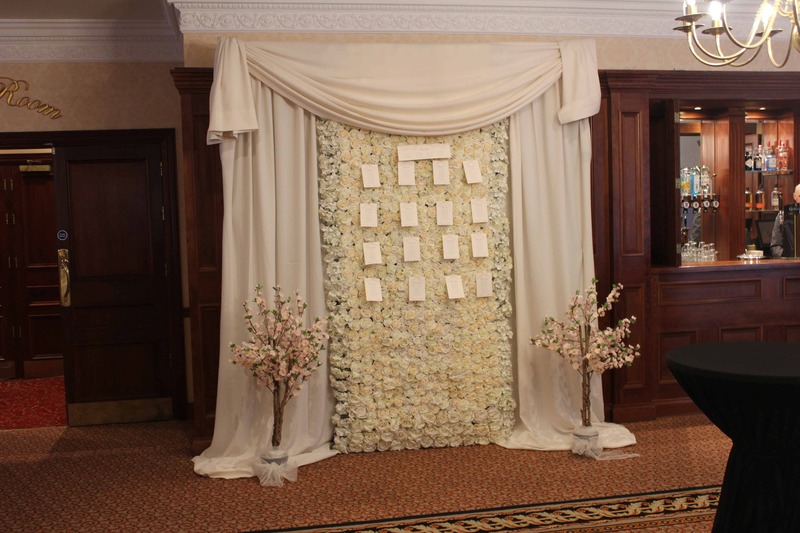 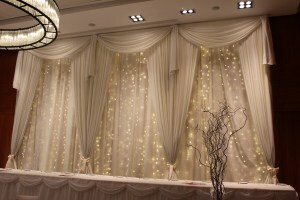 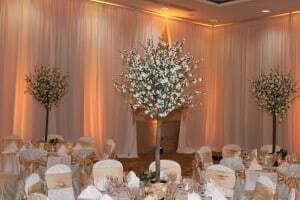 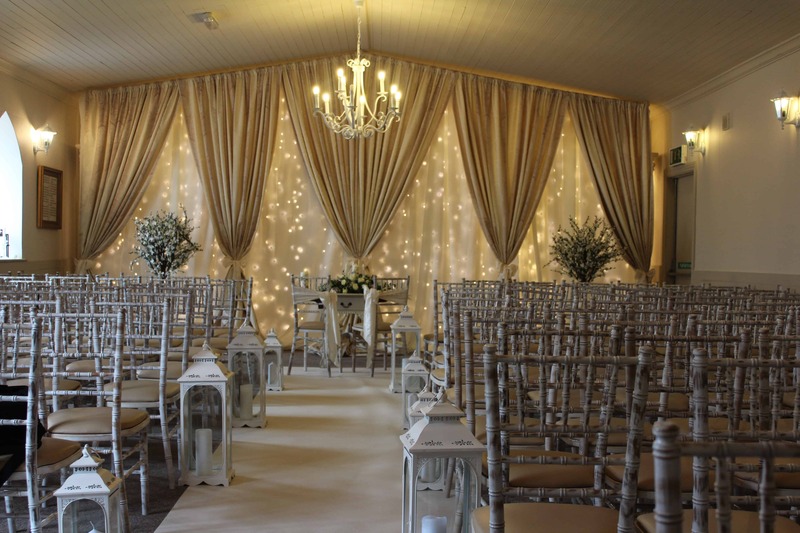 Custom Built Fairylight Backdrop In Ivory & Gold Can be built to any size. Custom Built Fairylight Backdrop In White & Silver Can be built to any size. 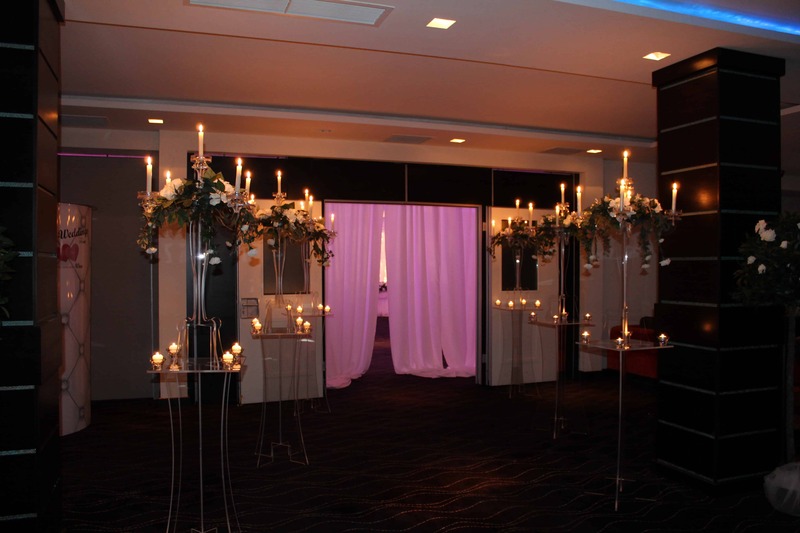 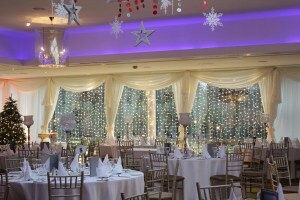 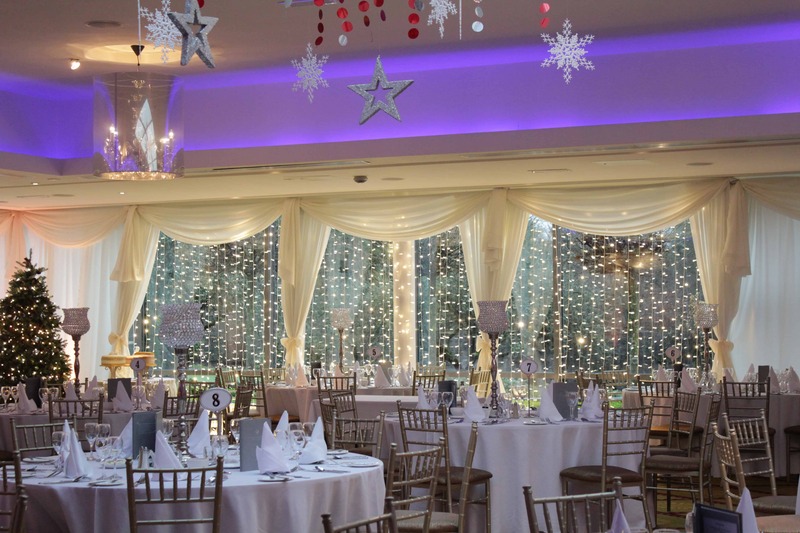 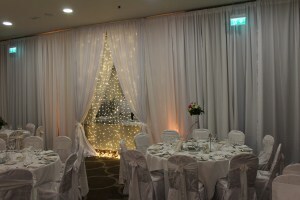 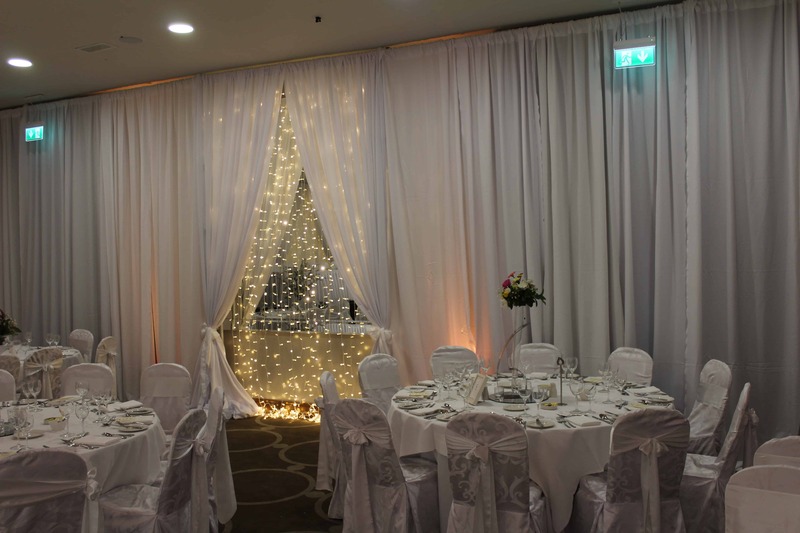 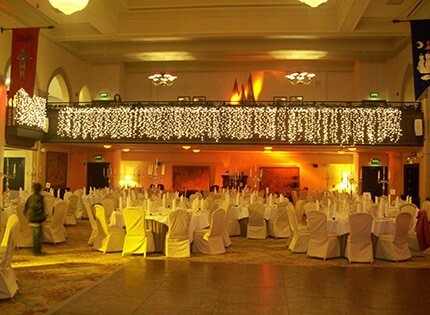 Fairy Lights In Windows With Custom Draping Can be built to any size. 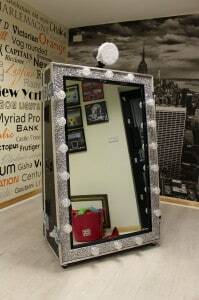 Fairy Lights On Mirror With Custom Draping Can be built to any size. 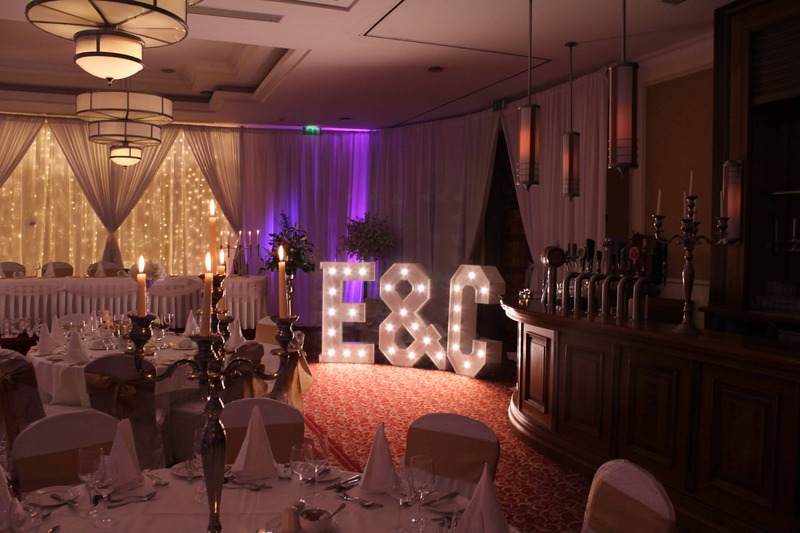 Fairy Light Panel In Plain Draping With Plain Top Can be built to any size. 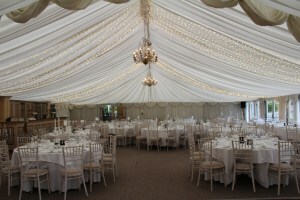 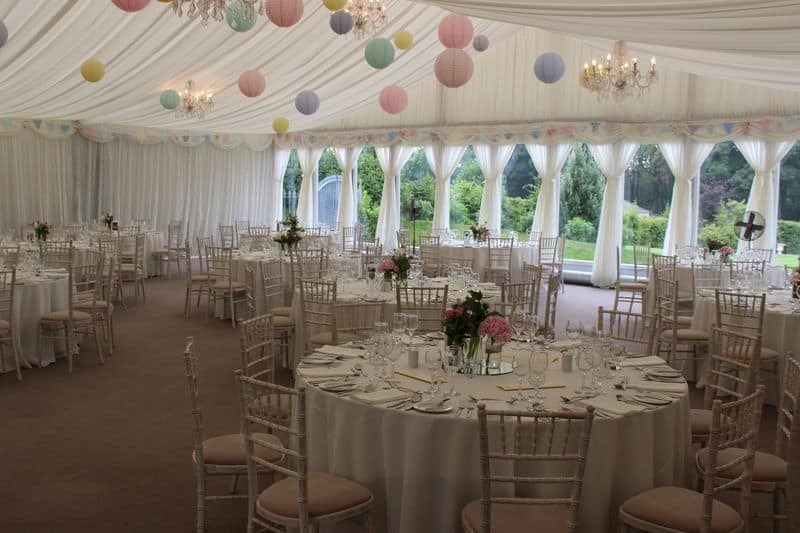 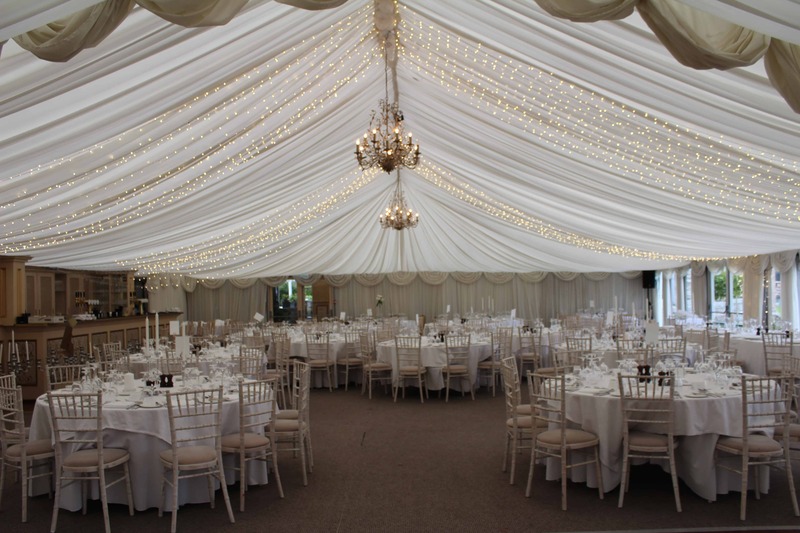 Fairy Lights On Marquee Ceiling Can be built to any size. Fairy Lights For Balcony Can be built to any size. 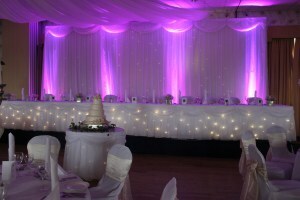 Long Fairy Lights No Draping Can be built to any size. 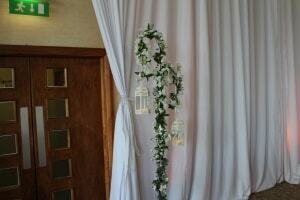 Fairy Light Door Drape With Swag Can be built to any size. 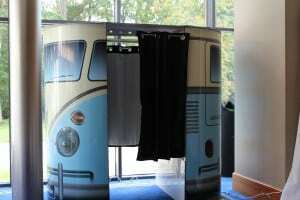 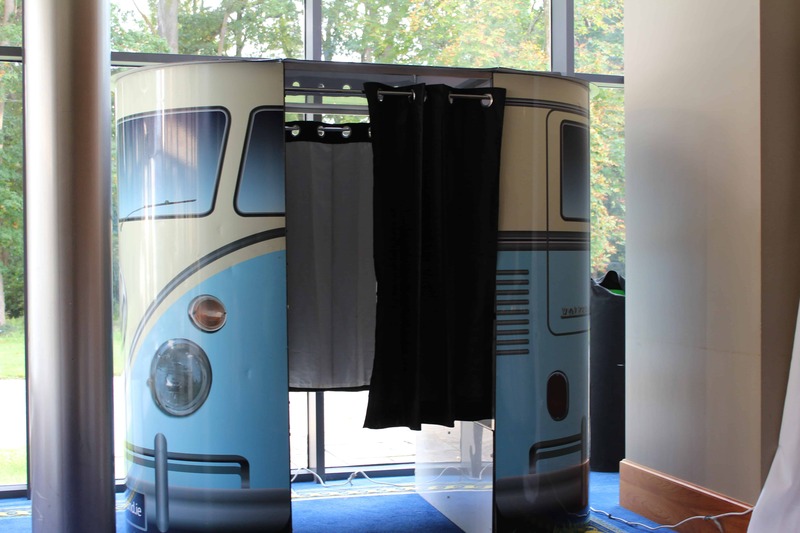 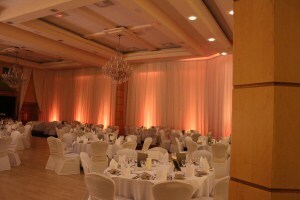 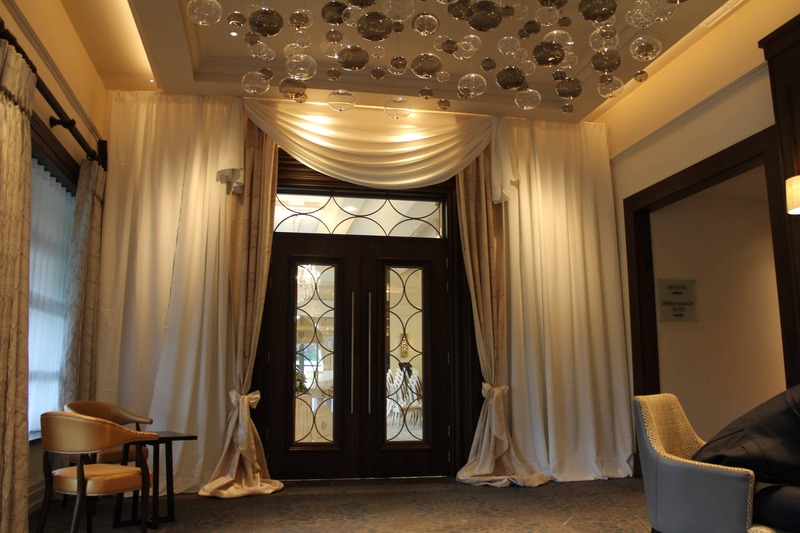 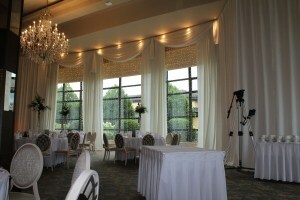 Custom Draping Can be built to any size. 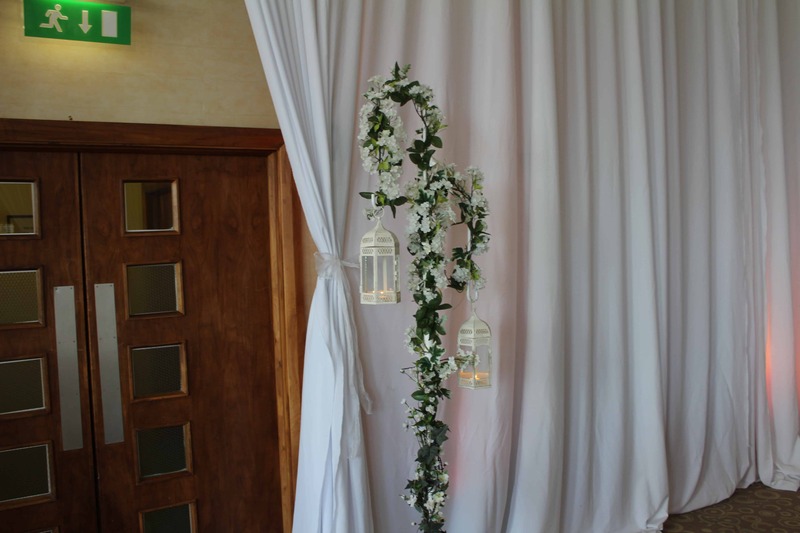 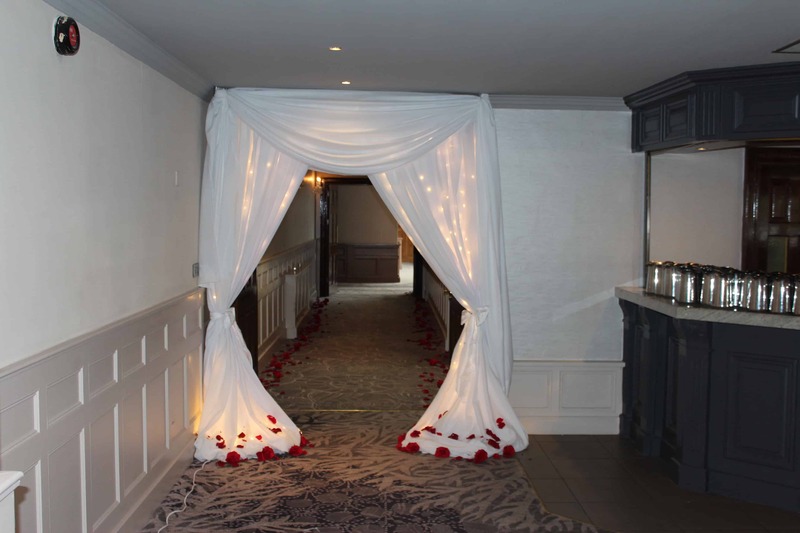 Entrance Door Drape No Fairy Lights Can be built to any size. Giant Letter Cake Table Also Available as a Candy Table or Prosecco Table. 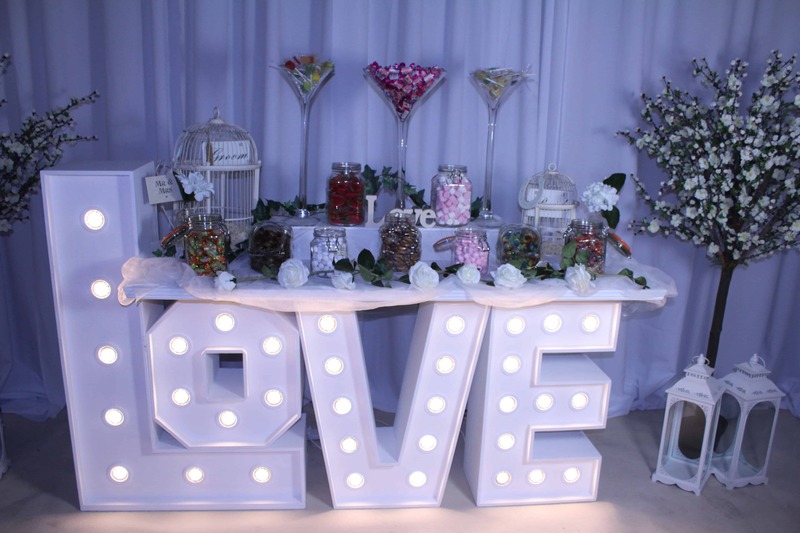 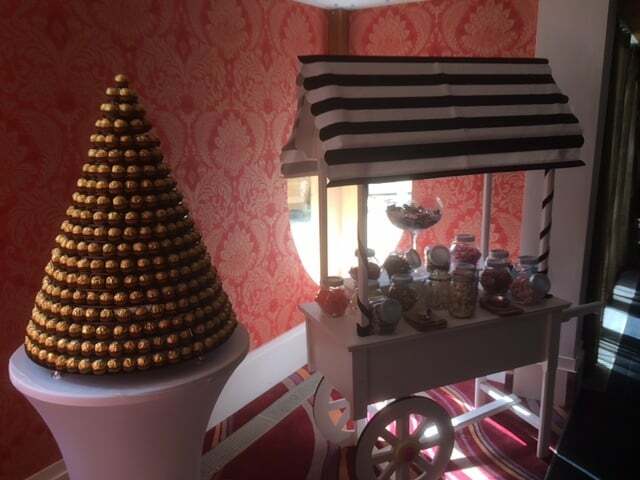 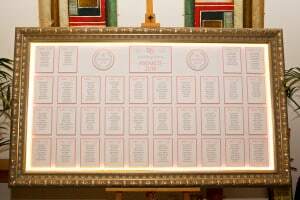 Giant Letter Candy Table Also Available as a Cake Table or Prosecco Table. 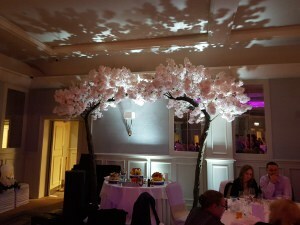 Cherry Blossom Table Centrepiece White Also Available in Pink. 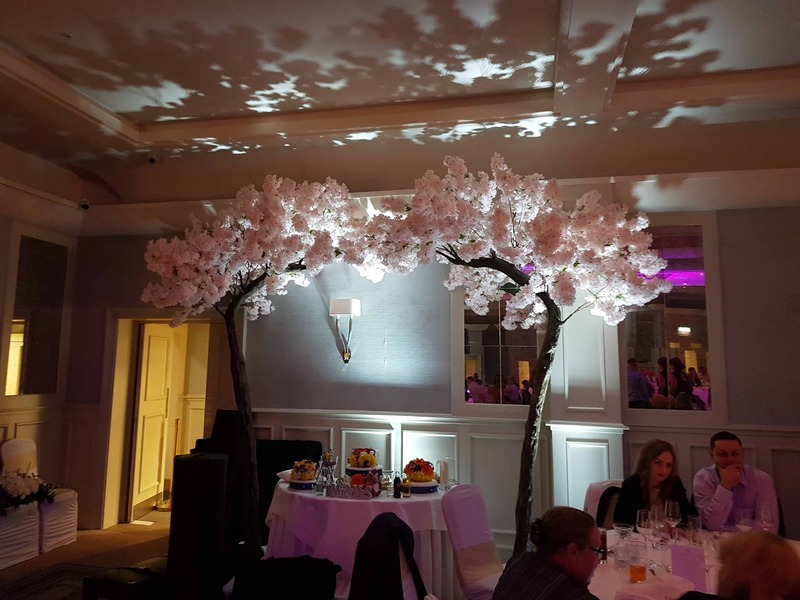 Cherry Blossom White Shepard Crook Lantern Also Available in Pink. Cherry Blossom Real Ice Melt in White Also Available in Pink. 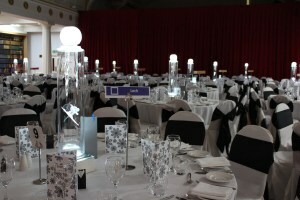 Table Centre Real Ice Melt Themed With Skier In Vase Available With Any Theme. 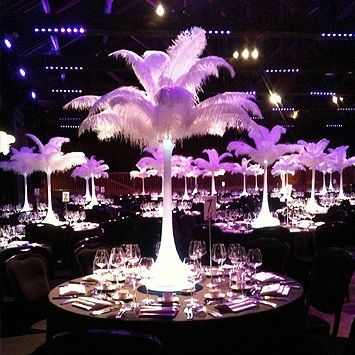 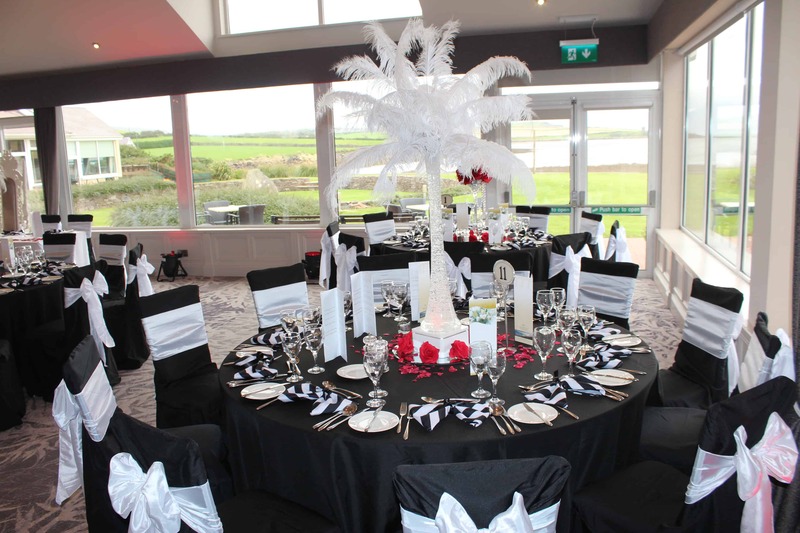 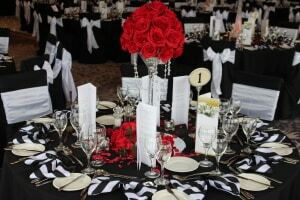 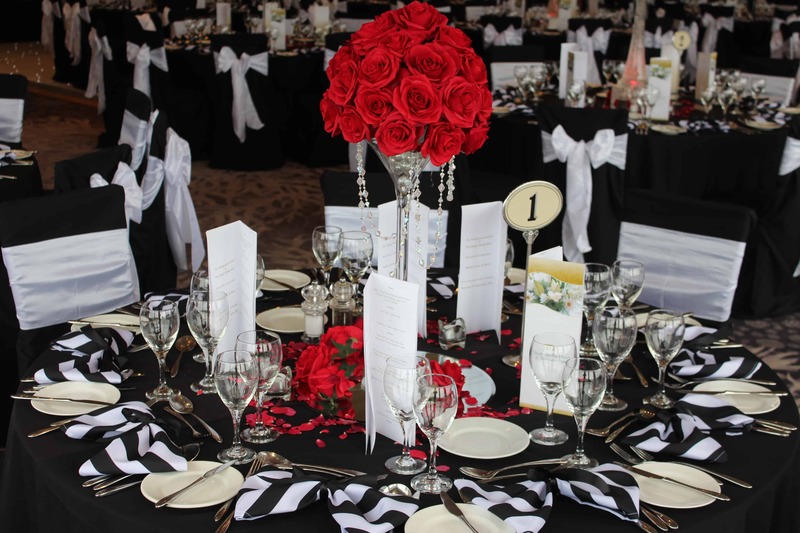 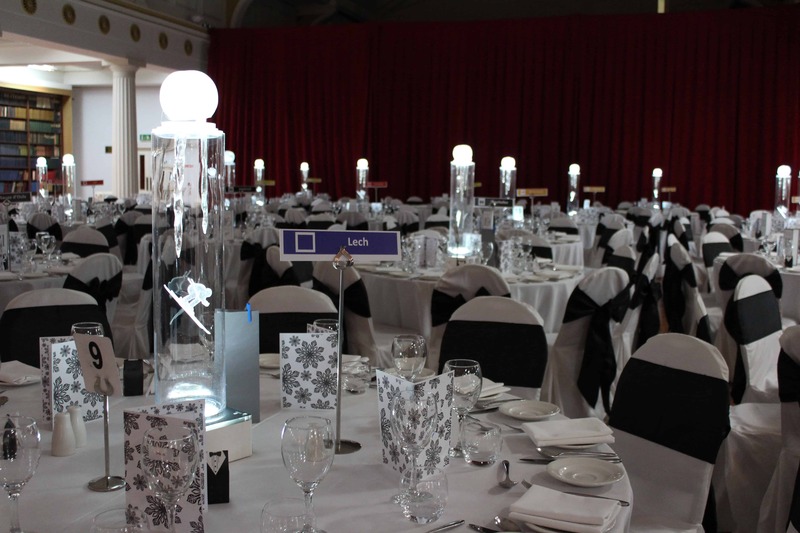 Table Centre Ostrich Feather Available In Black & White Also. 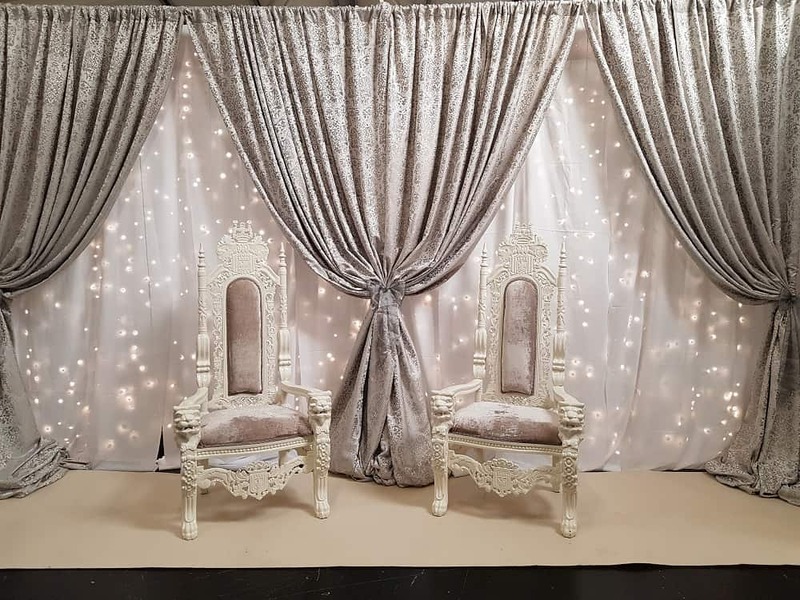 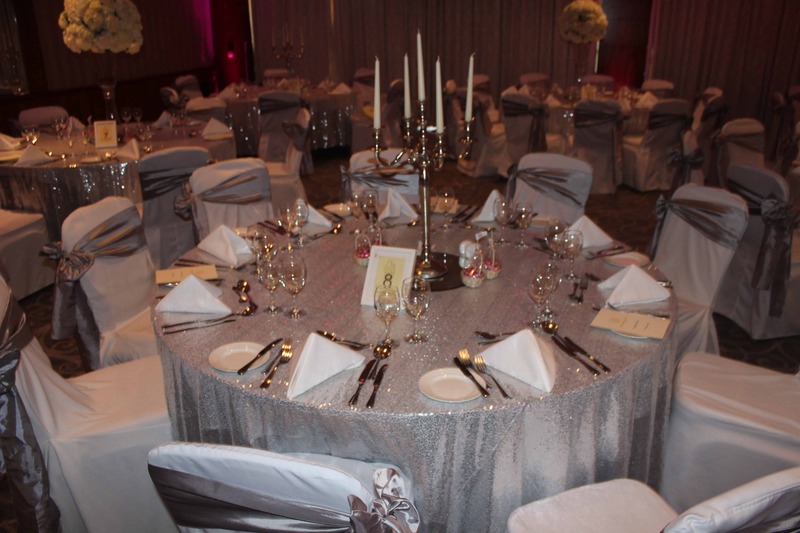 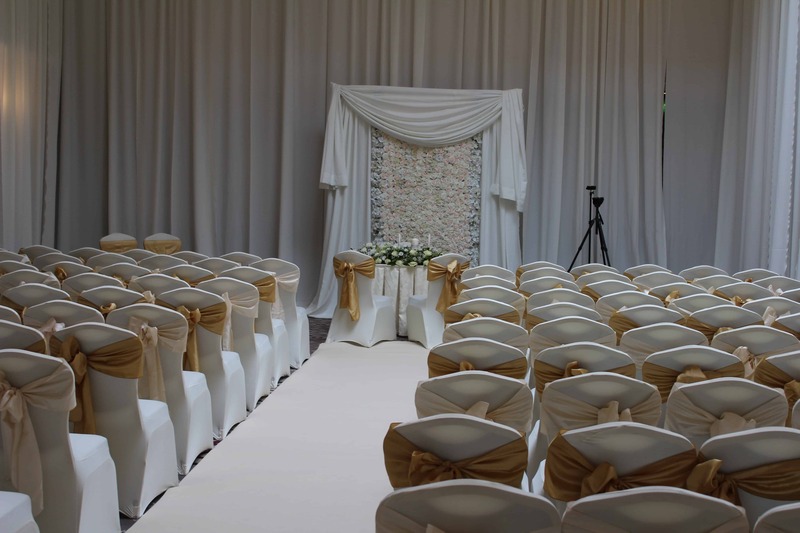 Chair Cover With Gold Sash Chair Covers available in White, Ivory & Black with 70 Different Sash Colour options. 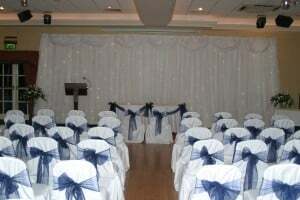 Sashes are also available to hire on their own. 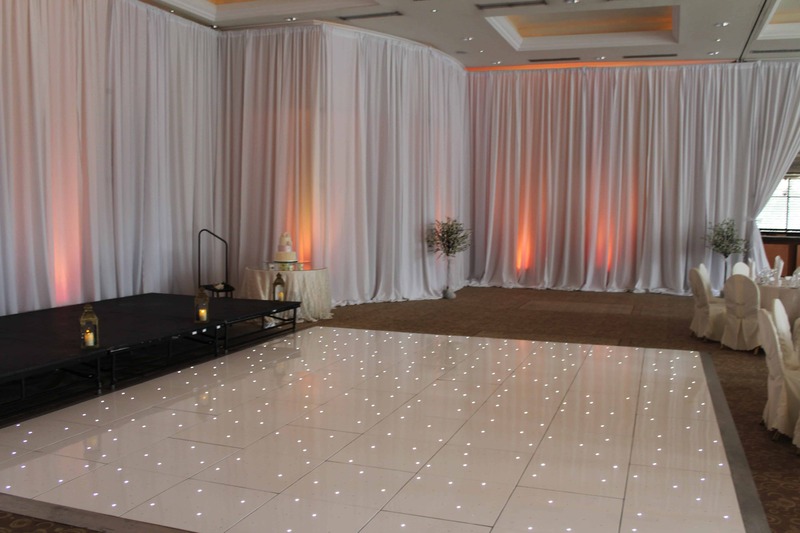 Ivory Carpet With Floor Lanterns Carpet also available in red.